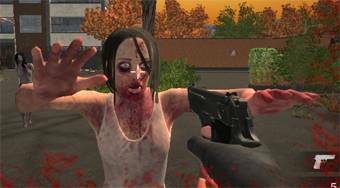 Do you like Zombie vs Janitor Game? Share it with your friends. Zombie vs Janitor Game is a deluxe 3D shooter game in which you enter the role of a porter from a college who is the only survivor of the apocalypse. In each round, your task will be to kill pupils and teachers who have transformed themselves into a bloodthirsty zombie as a result of apocalypse. After each round you can buy new weapons and other upgrades for the points you collect.